World number three Roger Federer said Saturday he is looking forward to working with his new-generation coaching team, after parting with 1980s champion Stefan Edberg. Federer announced this week he was shaking up his coaching team for 2016, with "childhood idol" Edberg leaving after two years of working as assistant coach to the 17-time Grand Slam winner. "The idea was only to do one year. 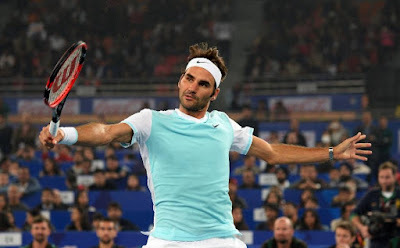 I couldn't believe it when Edberg said yes in the first place," Federer said in New Delhi, after taking part in the International Premier Tennis League (IPTL). "We had a great split in the sense that we've known for 10 months that it was going to end at the end of the year." Federer said Edberg's replacement, Croatian Ivan Ljubicic, a former world number three, would offer a new perspective as part of the current generation of players. "It's the first time that I've had someone within my team whose actually played on tour against the players that I've played against," he said. "My coaches in the past have all been players from a different generation. I think Ivan can bring something very exciting to my team, including motivation." Sweden's Edberg, a former world number one, won his six Grand Slam titles in the 1980s and early 1990s. The Swiss champion has said Severin Luthi will continue to be his main coach, continuing a partnership that began in 2008. "Edberg obviously was amazing, nicest guy, gave me great advice and I will appreciate that forever." Federer said he was excited about teaming up with fellow Grand Slam star Martina Hingis for Switzerland in the mixed doubles at the 2016 Olympics in Rio. "We are a little bit rusty after 15 years of not playing together but hopefully we have some time." He said it was likely he would also partner with countryman and world number four Stan Wawrinka in the men's doubles, saying they would discuss it early next year. Federer and Wawrinka partnered to win gold at the 2008 Olympics.